Falooda is a popular dessert- drink in South Asia. 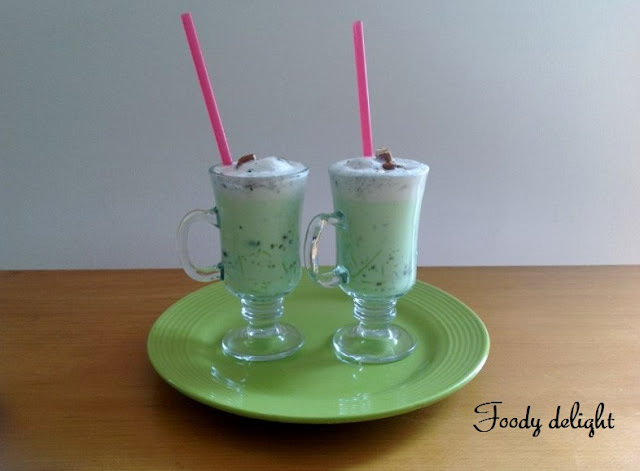 This drink is prepared by mixing rose syrup ,basil seeds and falooda sev(noodles) along with milk . Depending on your taste, different flavors like vanilla, strawberry etc flavored falooda can be prepared. Our favorite is "rose flavored falooda". 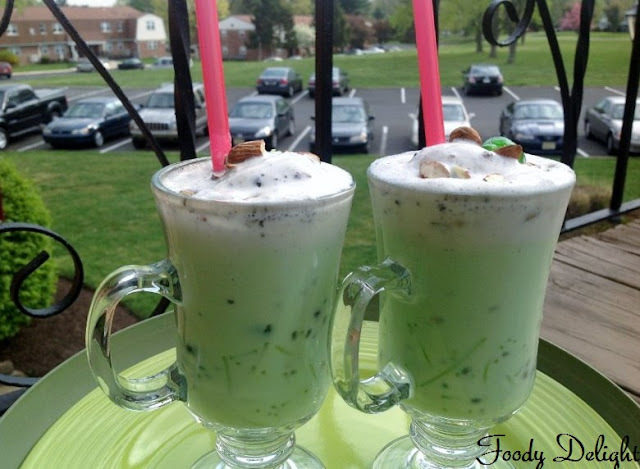 I experimented with this drink and prepared Falooda flavored with pistachios. It turned out to be tasty and a good refreshing drink after hard day's work. Hope you also enjoy it. Soak the basil seeds in water atleast for 2 hours. Boil the falooda noodles into water for about 15 minutes. When noodles are boiled,drain the water from noodles and keep it aside. Remove the outer skin of the pistachios and grind it to the fine powder. Pour the 2 cups of milk into pot and boil till the milk becomes half in its quantity. Then add pistachio powder, sugar and cardamom powder. If your using colour, at it at this point. Stir well and cook again for 5 minutes. Turn off the flame and allow the pistachio milk to cool down. First mix the 1 cup of pistachio flavoured milk with 1 cup of unflavoured milk. Take the glass of your choice. 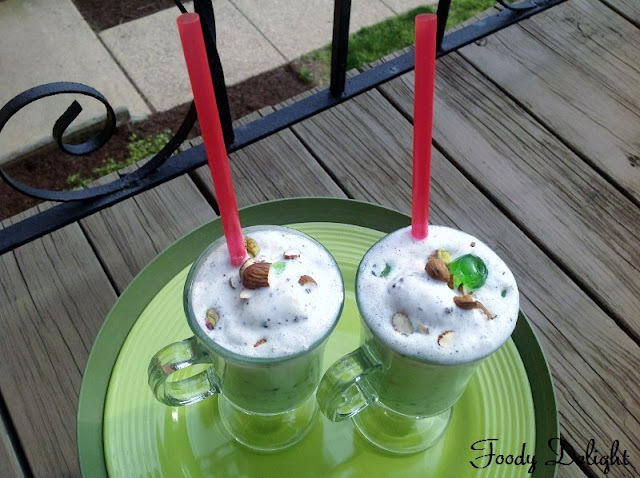 Fill the 3/4 of glass with the mixed milk,then add 1/4 spoon of soaked basil seeds and 1 tsp of falooda noodles/sev. Now slowly add a scoop of vanilla icecream and garnish with the chopped almonds and green cherry. Hi... I love pistachio very much... I dont know that i could end as a drink also... TQVM 4 sharing..
Falooda looks absolutely divine..i dont mind having it..
Nice space with lovely dishes! Love it ! 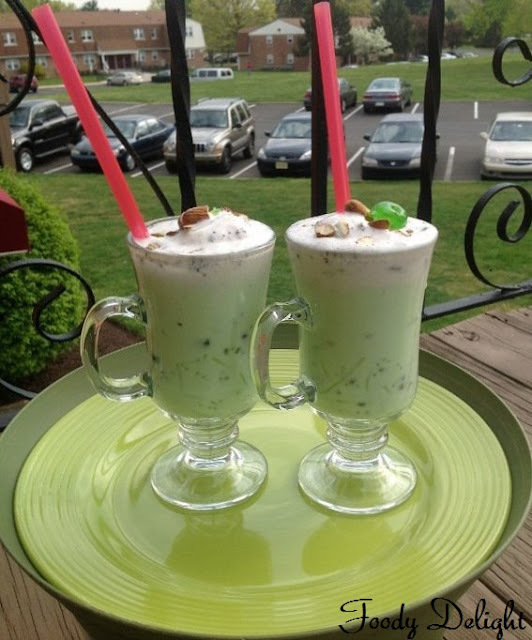 This goes right to my pistachio loving heart!